Opis: Tactically advancing across the battlefields like inhuman revenants, Imperial Death Troopers are a terrifying sight. Adorned in jet black armor and carrying an arsenal of weapons and equipment, these troopers are the elite soldiers of the Tarkin Initiative. Candidates are hand-selected from the Stormtrooper Corps by Imperial Intelligence itself. 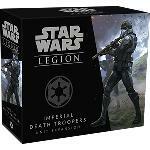 Trained to be efficient and merciless, they are also rumored to undergo classified medical augmentations.With the Imperial Death Troopers Unit Expansion, you can unleash these elite troops on the battlefields of Star Wars™: Legion. 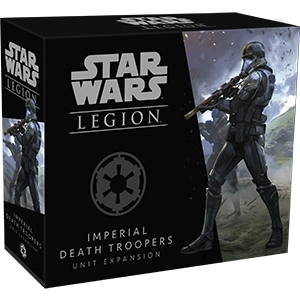 This expansion contains everything you need to add a squad of ruthless death troopers to your Imperial army, including six finely sculpted death trooper miniatures, a unit card, and an array of upgrade cards that give your Death Troopers access to even more advanced weaponry.